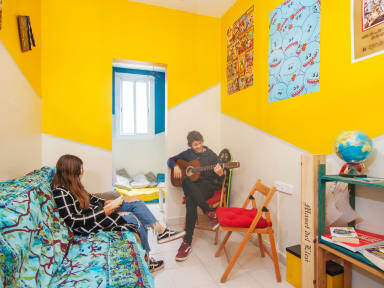 No Limit Hostel Sagrada, Barcelona, Hiszpania : Rezerwuj teraz! 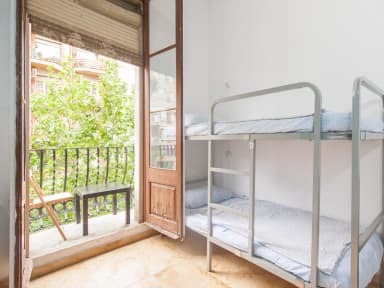 No Limit Hostel Sagrada Familia is located in the Eixample neighborhood in Barcelona, just 100 m from Sagrada Familia! We understand that travelling can be daunting, arriving in a big city, not knowing the area or even the language. That’s why we focus on making you feel comfortable and connected to the city and people in it, by providing you a warm welcome and a relaxing environment where you can put your feet up and plan your awesome stay! Barcelona is city of culture. Our mission is to show you it all, from in hostel activities, to fun events that delve into the unknown side of Barcelona. Exploring the Catalan architecture, the small alternative cafes, the sandy beaches, and much more! You’ll find backpackers from all corners of the world, nomads, travel bloggers, and of course art lovers! If you’re looking to see the world with new eyes, then we are your binoculares. - Each floor includes a shared bathroom. - A location that sits between the city center and the most famous city monuments! The nearest airport is Barcelona El Prat Airport and is a simple train/metro/bus ride away from the city. Our closest metro is Sagrada Familia (L2). Feel free to call if you need help finding us! Cancellation Policy: If you wish to cancel or alter your reservation, 48 hours of notice must be given. All cancellations must be made by e-mail only. Receipt will be sent to the email given at the time of booking. Telephone cancellations will NOT be accepted. We are a youth hostel, we only accept guests between the ages of 18 and 40 in our property. Our property is not suitable for elders. Guests under the age of 18 must be accompanied by an adult. A tourist tax of 0.72€ per person per night will apply for the first 7 nights. Tourist tax is NOT included in price of reservation and is to be paid at lodging establishment on arrival. Reservation must be paid in CASH only!